Watch Midway Channel Gallery's off the woven path exhibition come alive in freshly woven, not your typical runway scene. Taking place in a former wool warehouse, artists weave the past and present with an eye to the future in this eclectic show. Mingle with models wearing a collection of independent designs weaving together the art of textiles, fashion and jewelry. Listen to original musical accompanying their every step and accentuating avant garde designs in mood and expression. 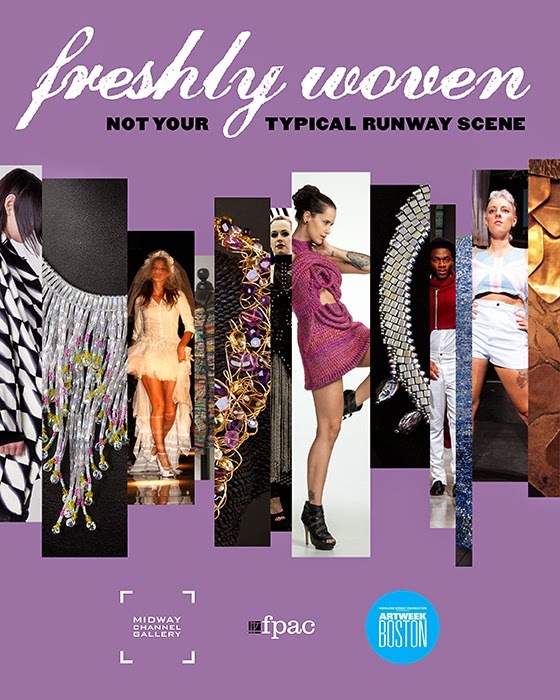 freshly woven is produced in partnership with Lasell College, Fashion Department Newton, MA, and is part of Artweek Boston taking place through May 10, 2015. Midway Channel Gallery is nestled in Midway Artist Studios, Boston's largest rental artist live/work building. off the woven path connects Midway Studios' past to the present and celebrates Midway Artist Studios first year anniversary as an artist owned building and tenth anniversary as a renovated artist building and community. The galley is located at 15 Channel Center St. 1st floor Boston, MA 02210.